Put your non-technical posts about F1's only junior team that admits it's a junior team here. Who's winning the Kvyat/Albon battle for distant parental substitute Helmut Marko's affection? Are either of them? Who else are Toro Rosso looking at? How exactly does the team work, anyway? Post your gossip here. Decent race from Kvyat on Sunday. Just what he needed to get some confidence going. Too early to tell with Albon. Was happy for Kvyat because that was a really good, mature drive from him. Always saw Kvyat as the kind of driver who would qualify ninth and finish fourteenth the next day so it was good to see that reversed really. Good qualifying for Albon, race was less convincing really but I think he's a pretty decent prospect. Can't get over the feeling that both drivers are seat-warmers though as RB wait for the next Verstappen to finish primary school. What happened to Albon's race, actually? He was ahead of Kvyat and running well... I think as high as 8th? But then came the pit stop, and suddenly he seemed to be way back in the field, never to be seen again...? Strong race from Kvyat. He did well to hold off Gasly. How exactly does the team work, anyway? They both seem like solid drivers, and the team is well run by expert team manager Franz Tost. Edited by V8 Fireworks, 18 March 2019 - 14:42. Yeah anyone caught in the Giovinazzi train effectively had their race ruined and their teammate who was behind them in the pitstops was able to overtake them by staying out on the overcut. Both Perez and Albon lost out, and I’m certain had Sainz not retired he probably would have ended as one of those who benefitted - like Kvyat and Stroll. Had the feeling from all the interviews that Kvyat has a lot more confidence again and he seems very happy to be back (already before the race ). I expect him to do well on that basis this season. Kvyat seems pumped up and ready to rock, looking forward to seeing him have a good year! Albon... I like the guy but had anonymous spells in lower categories. Hope he finds his feet fast and puts in some good performances before Helmut gets his chopping block ready. So maybe he was using a slightly lower down force set-up of the type that increases your tyre wear on race day. I bet Kvyat is very motivated - with his girlfriend they await for child. Albon got stuck in Giovanazzi train. God, so young!! Me and my wife are expecting our first currently and I'm almost ten years older than him. I see people in their mid twenties expecting children and just can't imagine it! He won't have much time for Game of Thrones anymore that's for sure. I like Kvyat and thought he did well in Melbourne, maybe the added maturity/responsibility will help him finally join the dots together. His fellow countryman Mikhail Aleshin is a fan as well apparently. He seems to think Kvyat is already within a shot of replacing Gasly, after just one race. Of course that’s a bit premature, but nobody expected Kvyat’s return at Toro Rosso, so who knows. If Gasly doesn’t perform, and Kvyat does, you wouldn’t put anything past Marko. Impressed by Albon again. If Gasly continues to disappoint I can genuinely see him being demoted with Albon taking over. They wouldn't make the same move with Kvyat. If Red Bull would choose someone to replace Gasly, it would be Kvyat. He has a lot more experience and seems more relaxed, error free and mature so far this season. Albon has made a very encouraging start. If he is this good already, I think Kvyat may be history (again) unless Ticktum screws up his SL chances - which is on the cards if the Asia F3 debacle is anything to go by. 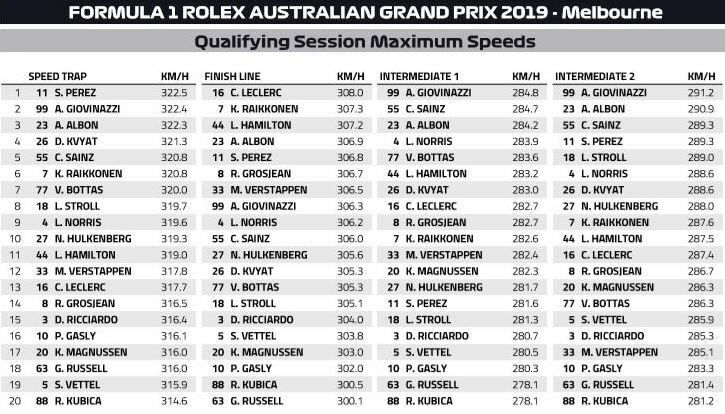 And with Gasly underperforming so alarmingly at RBR, maybe it will be Albon that makes the step up? Not convinced that Albon would look good against Max in Red Bull were he to get promoted, or any better than Gasly for that matter. Remember, last year Gasly comfortably beat Hartley and looked pretty good at times. Red Bull's problem is that their junior programme has dried out, so they have no proper talents coming up. If they want to get an upgrade on Gasly, they would need to swallow their pride and look outside their junior programme. Well, if Max left RBR after 2020, they would need to do it anyway. No way Gasly-Albon line-up would be something to go forward with in the Red Bull A team! Edited by sopa, 03 April 2019 - 10:41. Nah, I don't think that would be on the cards. Max was a special case. Promote him immediately or lose him to Toto forever. Albon is doing well, but it's early baby steps against a......Kvyat team-mate. Albon has done brilliantly on the basis of what he hasn't done: repeatedly binned it, wrecked his tyres, rocketed backwards at the start, trailed behind everyone else, been blasted by Marko. Pretty good for a genuine rookie. Another impressive race for Albon, albeit with a crash in practice this time. With Kvyat's continued inability to string a clean race together, and Gasly miles off Verstappen's place, he looks to be in a strong position right now. If they replace Gasly, Albon is the one they will choose. He is fast and calm. But I think Gasly will stay for the season. Unless he keeps performing like he is now, then I can see Albon replacing him before the end of the season. Yes, I don't expect any changes soon, but Albon is doing a good job of putting himself clearly next in line. Gasly drove exactly the same, if not better, than Albon last season. Albon has even less experience. If you promote him now, you’ll just ruin another F1 career for a young driver. IF Gasly is replaced, Kvyat is the right man. More experienced. Albon did really well to get back from that chassis rebuild and a pitlane start with a point. Also props to the team for getting the car to that level, of course. Makes you wonder where Kvyat might have ended up without the touch and penalty. I feel that a 5 second penalty would have been plenty. Hey, it was the first lap and Norris rejoined the track at a decent angle. Without the rear breaking traction, might it not have been a touch anyway, 100% on Norris? We'll never know. Kvyat will have to start earning his place like Verstappen did being "too young" for a long while, usually getting harsher penalties than others. Compare his Grosjean crash and the Alonso/Gutierrez one. And there were other instances. I do hope Daniil gets all the way back to his 2015 shape and beyond. He's mighty when fighting. One thing that can be said is that at least Albon seems to be a decent addition to F1, even if he isn't a super talent. Toro Rosso/Marko hesitated a lot before calling him up, but he seems to be doing just about fine at least on midfield level. 100% on Norris? We'll never know. I think we all know. So did the stewards. Hitting one Mclaren might be deemed to be a misfortune, hitting them both in one torpedo attack was simply the inept driving that we all expect from Kvyat. Norris was entirely the innocent victim. Sainz maybe 1% at fault for being unwise enough to be on the same track as Kvyat. Today was a good day for Ticktum, as his seat at TR looks tantalisingly closer than ever - if only he could get those pesky superlicence points. The chassis seems pretty decent this time around, both drivers seem to have similar pace to the front of the midfield but it's difficult for them to stretch their legs with all the traffic and the various problems they've had in qualifying. No, just no. Sainz hit Dani, who was launched into Norris. Just noticed on StatsF1 that this was apparently the 250th race for Toro Rosso. Not bad! Quite a few nice names among their former drivers, too: Vitantonio Liuzzi, Scott Speed, Sebastian Vettel, Sebastien Bourdais, Jaime Alguersuari, Sébastien Buemi, Daniel Ricciardo, Jean-Eric Vergne, Daniil Kvyat, Max Verstappen, Carlos Sainz, Pierre Gasly, Brendon Hartley and Alexander Albon. Just like the boxer who hits his opponents fist with his chin? Albon has always been impressive to me, in Karting he won everything. in cars was good but not mind blowing, in F3 and GP3 he was very quick but had errors and in races faded. However having personally worked with drivers who raced against him, they all, with no exception, held him in very high regard for his speed. so I am not sure if the car teams he worked with screwed him over (he had no money or sponsors to work with the real good teams), or maybe he has some issues getting cars to his liking. So his F1 career i follow with curiosity, so far he has shown he is a real talent. Protesters viciously hitting policemen's boots with their heads.....Kvyat hit Sainz and ricocheted into Norris. Albon has quietly impressed me. Perhaps not a super talent but he isn't out of his depth and took responsibility for his one significant mistake. With regards to Gasley, I think we need to see more of him at RBR. Calling Albon up to RB would be premature but it won't happen. They'll persevere with Gasly for this season at least. Because...who else? Albon way premature as said, and Kvyat to me doesn't seem to have changed much since 2017, disappointingly. Of course, haters have to hate. Sainz was sticking his front wing up Norris' rear wheel at the same moment Kvyat took attention away from the McLaren-self-inflicted-contact. They should thank Kvyat for taking the attention away and bringing some penalty points home.